Tom P: Not a packed week for me but a whole lot from a galaxy far far away... 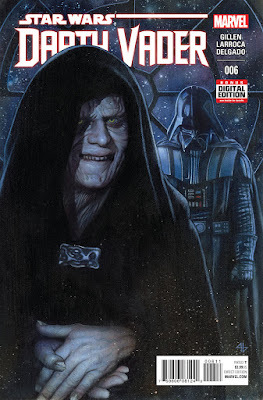 I thoroughly enjoyed the last instalment of Darth Vader after I being left dissatisfied with the previous issue - it won me back with a great action set piece so I'm more than happy to pick up issue #6! Then it's time to pick John Cassaday's last shot of Star Wars. I've really loved this book after unfairly dismissing it initially - so far it's been, in my opinion, a real blockbuster of a comic with a creative team who've clearly relished working on it. The detail Cassaday has pored into every page is apparent and has been his finest work in years. The return of a master. Secret Wars #3 rounds the list off for me - the last issue was epic in its scope and vision. Hickman continues to take his high concepts and give us an event of real intelligence and spectacle, and boy, is Esad Ribic the fella to call for spectacle! But let's face, it Hickman had me on board from his Dark Reign: Fantastic Four miniseries, where he started this story so many years ago. As its light week I think I'll also treat my self to a B.P.R.D. : Hell On Earth trade. Would be rude not to! Matt C: Secret Wars is where it's at for me this week after that show-stopping, revelatory second issue which proved that, with some effort and gumption, it's still possible to make an event book that thrills, entertains and surprises. I'm hugely excited to see how the third instalment pans out, although none of the spin-offs have caught my eye in this batch of releases. The other major highlight this Wednesday is Nonplayer #2, the long delayed follow up to the sterling debut issue that set tongues wagging back in April 2011. It was inventive, stylish and immediately impressed, so much so that even four years later it's eagerly anticipated. I just need to remember what happened in that issue I read four years ago!